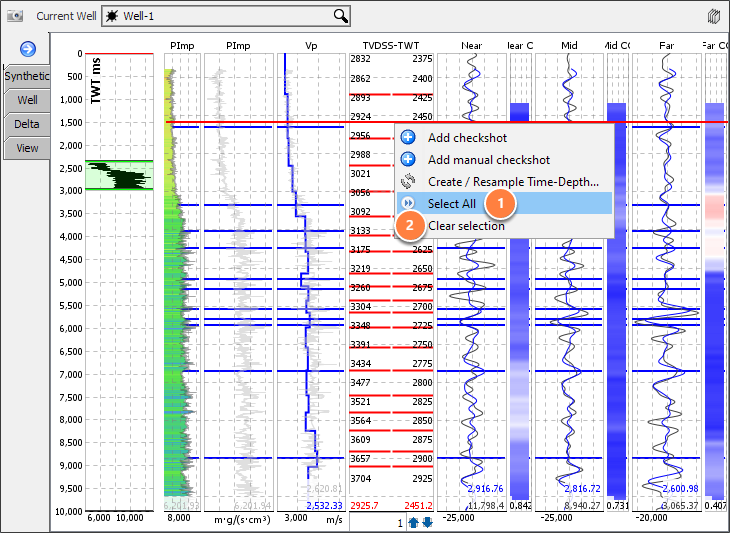 DUG Insight provides several tools for working with wells time-depth sets and checkshots. 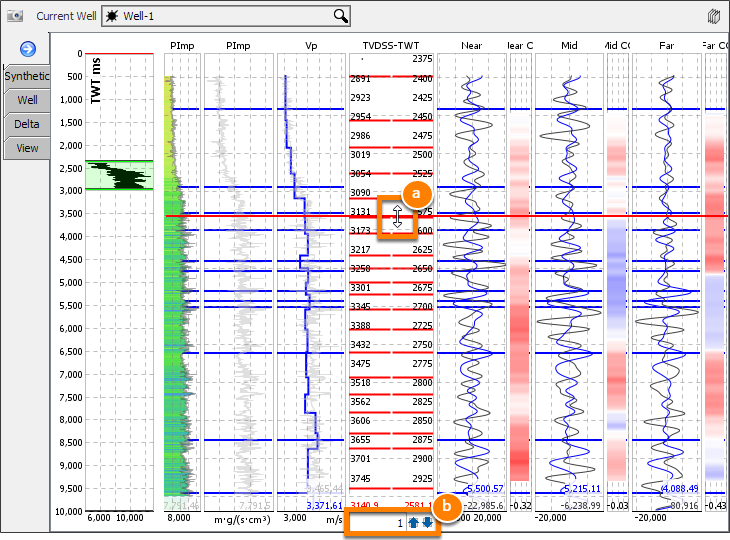 These tools are available by right-clicking the checkshot track in the Synthetics view (see Editing Time-Depth Pairs). To create new time-depth pairs from known time-depth values, see Manually Creating Time-Depth Pairs. Resample dense (or sparse) checkshots while preserving velocity boundaries (see Resampling Time-Depth Pairs). Copy time-depth pairs from another well (see Generating T-D Pairs from another well). Calculate time-depth pairs from a sonic log (see Generating Time-Depth Pairs from Sonic Log). Calculate time-depth pairs from a velocity model (see Generating Time-Depth Pairs from Velocity Model). When resampling and creating sets from logs or velocity models, the accuracy setting creates sparse checkshots while maintaining a high level of time-depth conversion accuracy. 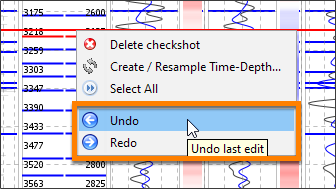 Time-depth sets support undo / redo and changes can be removed, or reapplied. To undo or redo a change, right-click in the track and select Undo or Redo. Undo and redo actions are also available from the well component view. Use Select All to select every checkshot of the current well. Click Clear selection to unselect checkshots. Note: The Select All option is disabled if the well is horizontal or has a section where the TWT decreases with increasing measured depth. Use Bulk Shift to make adjustments to the selected checkshots. Right click the checkshot track and click Select All. b. Enter a value in the text field and click the arrow buttons to shift by that amount. 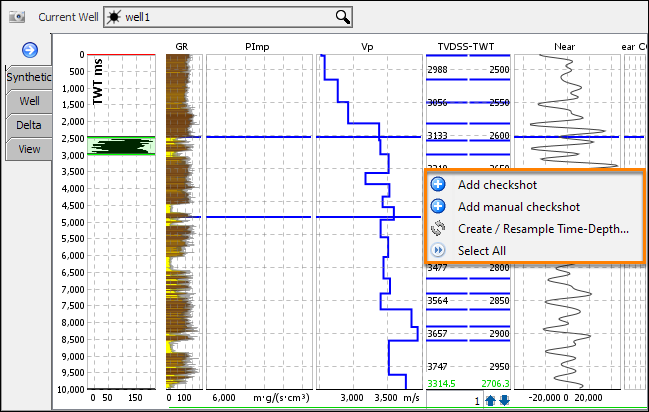 Note: To apply bulk shifts to a well with a horizontal section or decreasing TWT, export the checkshots and edit them externally in a spreadsheet.